First let’s describe what GPS is and how it works. Most everyone is familiar with GPS today since it’s built into most vehicles, cell phones, health bands and even inexpensive drones (thanks to cell phone low cost technology). Global Positioning Systems take advantage of US (and in some cases, foreign countries) free satellite location and time broadcasts. Knowing the exact location relative to earth orientation at a specific time for a satellite is what gives GPS receivers the ability to know where they are on earth. This is based on the satellite broadcasting its location and time of transmission for each signal, and the receiver knowing the time of arrival can then determine the distance. It is typical to use a minimum of 4 satellites to acquire a solid location on earth. That is why the US fleet of GPS satellites alone is 31. I usually encounter a minimum of 7 viewable (picked up by the receiver) satellites at any given time of day. Some GPS receivers take advantage of Russian Global Navigational Satellite System (GLONASS), which came online in mid 2000s. Other nations are coming online with their own satellites and global navigation system too. Often we at Kruse Integration get requests to provide a “Dredge Positioning System.” This is a key phrase for GPS with dredge digging tool tracking and logging. It combines the GPS receiver(s), antennas and computer with tracking “positioning” software. Most dredge positioning software products work with most of the available GPS receivers on the market. We are not talking about the little GPS navigators that you put in your car; the marine units for dredges are robust with high accuracy. 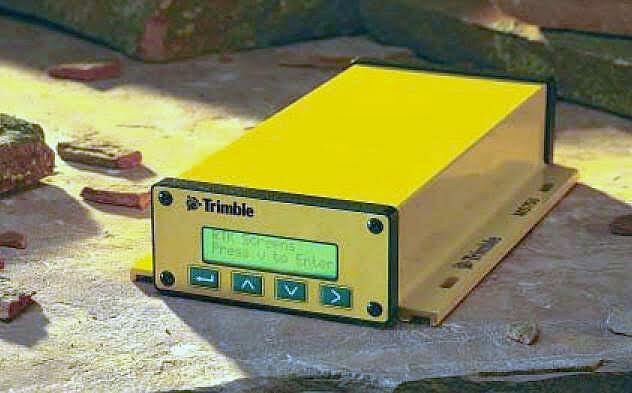 DGPS systems (Differential GPS) are typical for sub meter accuracy systems. They often take advantage of nearby US Coast Guard Beacon stations (beacons are located in known earth coordinates, and broadcast satellite correction information) and they do no receive accurate elevation (height or actual depth relative to sea floor). DGPS is often combined with an automatic tide gauge, which will send actual tide to the onboard DGPS receiver. Higher accuracy systems incorporate GPS base stations, which are usually owned and operated by the dredging contractor and setup nearby the dredge site in a known earth coordinate to broadcast correction offsets and realtime elevation to the onboard dredge receivers. This is known as RTK (Real Time Kinematic) and will cost more when you purchase receivers with this capability. 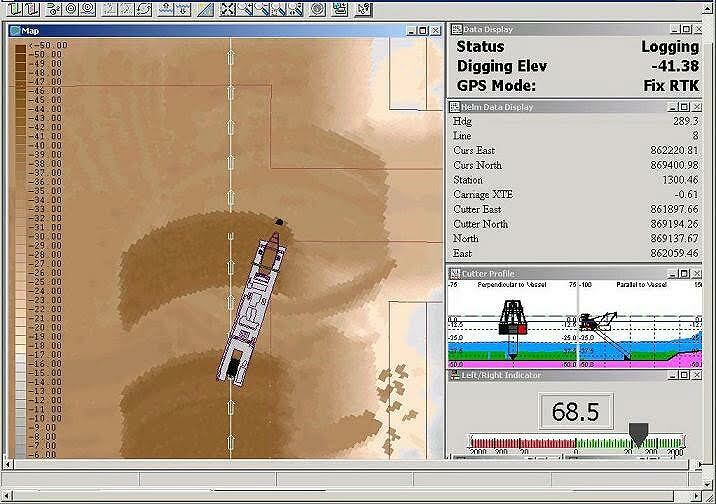 A “Dredge Positioning System” is a software package that will display a survey or map of an as-built color bathometric surface of the area to be dredged. The software will interface with the GPS receivers and show a superimposed view of the dredge location in real-time over the survey. This map will be updated as the dredge digs, allowing the Operator to visually see his progress as if he were a scuba diver in the water watching the cutter. In our experience working with Sand & Gravel Plant dredges as well as Dredging Contractors since 1997, we have quickly recognized several differences for the need to use “Dredge Positioning Systems” in each of these realms. Sand & Gravel ponds are man-made water ways, which do not have tide associated with them. They also don’t come under the jurisdiction of coast guard navigable waterways since they are private property. Additionally, the typical sand plant owner doesn’t have any staff to support bathometric surveys or RTK GPS and is usually not using elevation or tide from the GPS. They simply want to know how deep they are dredging below water level. Whereas the dredging contractor is usually performing a job for the Army Corp of Engineers, Department of Natural Resources or EPA. These projects require stricter accuracy, accountability, logging, records and reports. For the Sand & Gravel plant owner, DGPS is a great investment, which allows management to see where they’ve dredged, material processed from locations, proof of digging permit compliance, volume removed (production), mark trouble spots, and reclamation plan contour control. The “Dredge Positioning System” is often a hard sell to the sand plant owner, but I have witnessed once they have it, they can’t do without it in every case. Dredging contractors are always charged with the responsibility to dig in predetermined areas that have over and under dig limits. For environmental dredging projects, these limits can be a tight as 1/10th of a foot accurate. It is very common to find a staff of trained surveyors familiar with the positioning software and the RTK receivers since this is such an important part of the contract. Kruse Integration takes advantage of positioning software through use of OPC compliant software packages. OPC is a software communication standard, which allows Windows based software packages to share information. So with an OPC compliant positioning system, we are able to extract most any information from the dredge positioning software as well as send data and parameters to the dredge positioning software. With this technology, Kruse Integration has performed dozens of custom automation projects on cutter suction dredges, cranes and excavators all equipped with GPS, positioning software and a PLC (programmable logic controller). Imagine having the dredge automatically follow a channel design, reclamation plan, slope contour, plan cut lines, or even automatic swing control. This, and more is what we are doing with positioning systems as an add-on automation value.